“So – this – is – a – River!’ said the Mole, pulling himself together with an effort. I am training for a running race, again. ’tis that time of year. But months of slack behaviour and advancing age has taken its toll. The spirit is willing but the flesh is weak. So I took to the river. To run. Because there is no more beautiful place to run than along the Thames. I managed 9 miles. I was slow. It was painful. But the Thames spurred me on. As it always does. The body didn’t feel so good; the soul was soaring. “Take me to the river…,” oh David Byrne, you know of what you sing. The Thames may be filthy, and I would never want to be tossed in, but to be on it or along it is always a treat. Sometimes is it precariously high; I watch those lions carefully during extra rainy days, believing completely in the expression “if the lions drink, London sinks.” But it is beautiful when it is roaring and swirling with passion. When it is at very low tide enterprising builders create amazing sand structures. My favourite was a couch and television, complete with can of beer. All made of the gritty stuff. Recently I helped cajole more than 30 wom en to don attractive hi-vis jackets and stroll 13 miles along the Thames Path from Kew to Clapham, for charity. 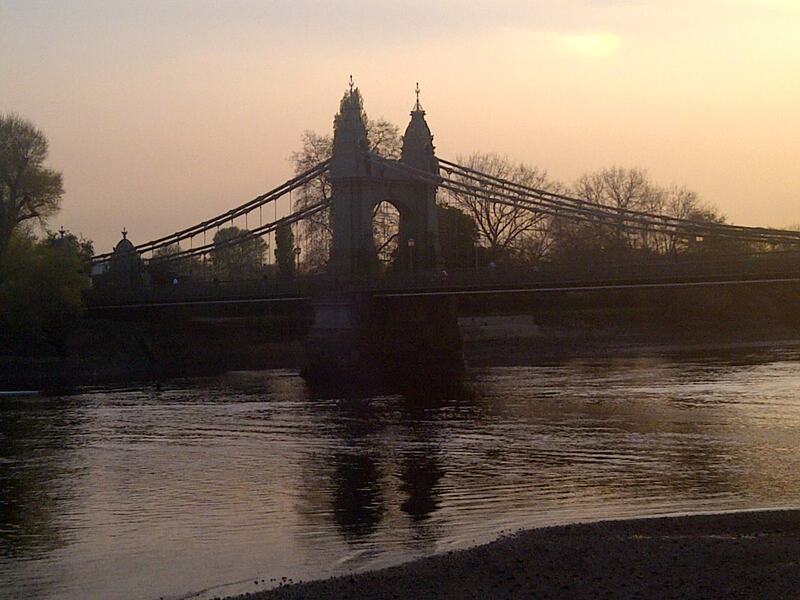 I have also spent an evening drinking wine with a friend on the patio of Riverside Studios, as the sun set majestically over Hammersmith Bridge. Several years ago, while training for the MoonWalk, (an a ll night 26 mile walk through London), my friend and I came upon the Gloriana, the lead vessel in the Queen’s Thames Diamond Jubilee Pageant. I watched the Jubilee flotilla, a few weeks later, with great emotion, in the pouring rain, from the Tower of London. And two weeks ago I may have topped it all. 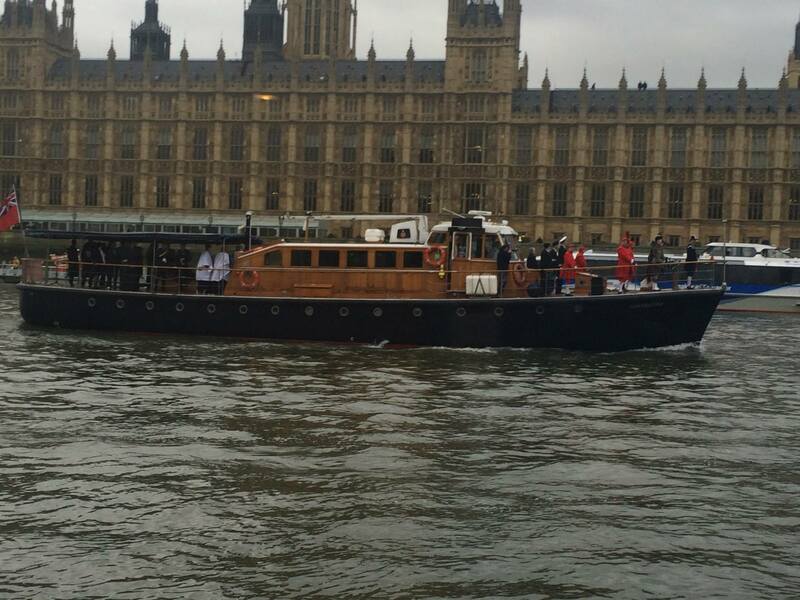 I rode in a boat just behind The Havengore in the flotilla to mark the 50th anniversary of the funeral of Sir Winston Churchill. I, American Anne, along with equally enthusiastic friends Sarah and Alex, was in a boat traveling on the Thames, behind The Havengore, the original barge that carried Churchill’s coffin to Westminster in 1965. In this glorious re-enactment, the Havengore sailed from the HMS President, near the Tower of London to Westminster. Where a wreath was placed in the water in front of the Houses of Parliament. Tower Bridge opened. And WE sailed under. I was covered in goosebumps, except for the places I was pinching to make sure I wasn’t dreamin g. We waved wildly at everyone on the riverbanks and the bridges. We felt like royalty. I had truly, truly shared in a moment of history. The Thames gave me to something exceptionally special. Again.